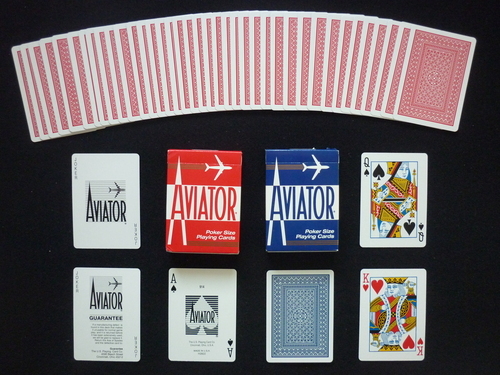 The Aviator brand was introduced in 1927 in commemoration of Charles Lindbergh's trans-Atlantic flight. The cards feature a bordered, monotone back design of predominantly circles. They are comparable in quality to Bee and Bicycle cards (although they have a smooth finish and a slightly thinner stock) and are available in the same general assortment of back colors, card sizes, and card configurations. Often sold at airports.